Good Evening! Happy Sunday, hope you all had a wonderful week. I had a fairly busy week as usual, but at least we had some sunshine the last two days, just glad I got all the washing dried and ironed with some slightly cooler wet weather around. I am here today to share something super fun and and somewhat frugal. Have you seen Brushos? Brusho is a brilliantly intense paint powder that comes in little pots and is water-based and completely non-toxic. After trying to access these little pots of magic online to purchase them, I found that exercise extremely difficult here in Oz (Australia) to obtain, so I resorted to making my own. I have collected quite a few sets of KOH-I-NOOR water colour wheels over the years, but also knew the two cream coloured wheels I owned were extremely pigmented, so I sourced KOH-I-NOOR (Brilliant Water Colours) and found they actually made a 24 pack in the same set and I purchased them. I crushed these in a mortar and pestle lining both with fresh foil each time and then stored the powder in some children’s paint pots (cheap set found at a $2 shop) and the excess paint from the pots I am using up on some mixed media pages. Each colour pan in a wheel yields 3 grams of powder, but it will go a long way. I will eventually pierce a hole in the top of each pot, so I can spray water and sprinkle straight from the pots. As you can see from the images above they give excellent results. *Note: Crushing these is not for the faint hearted! I had blue up my nose (why blue, when I crushed all the colours? ), blue under my feet as the powder is so highly pigmented and very fine when crushed. I would suggest crushing these outside in a ventilated and breeze free area and also suggest wearing some disposable gloves is a must (my hands were unrecognizable! ), but it was fun. I found the foil crinkled up in the mortar and pestle and the powder wanted to settle in the tiny crevices, making it tricky to tip out so I used a fresh piece of folded paper for each colour and tapped it out onto the paper for easy transfer to the tiny pots, but it may be worth trying some baking paper on top of the foil, I think the baking paper would be better than foil for easier transfer. If you think of something else let me know or show me what you created, but most of all have fun with it! 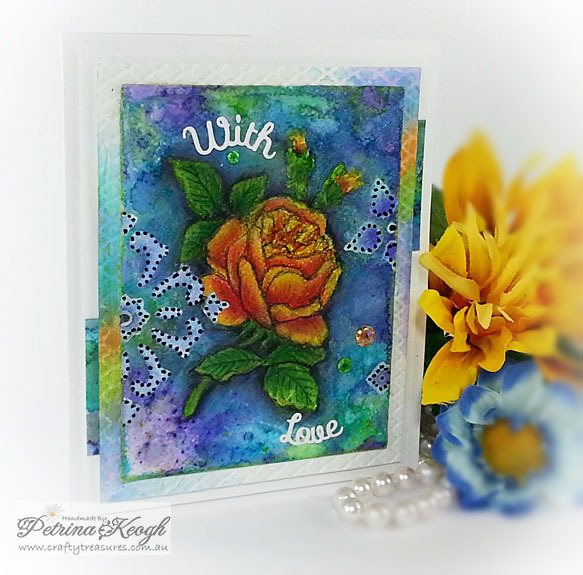 Here is a card I made with Crusho’s (Koh-I-Noor – Brilliant Water Colour Wheels crushed) and a retired PSX stamp, an oldie but a goodie! Misc: Masking Fluid, Water, Coffee Too! Brilliant! I love frugal alternatives.